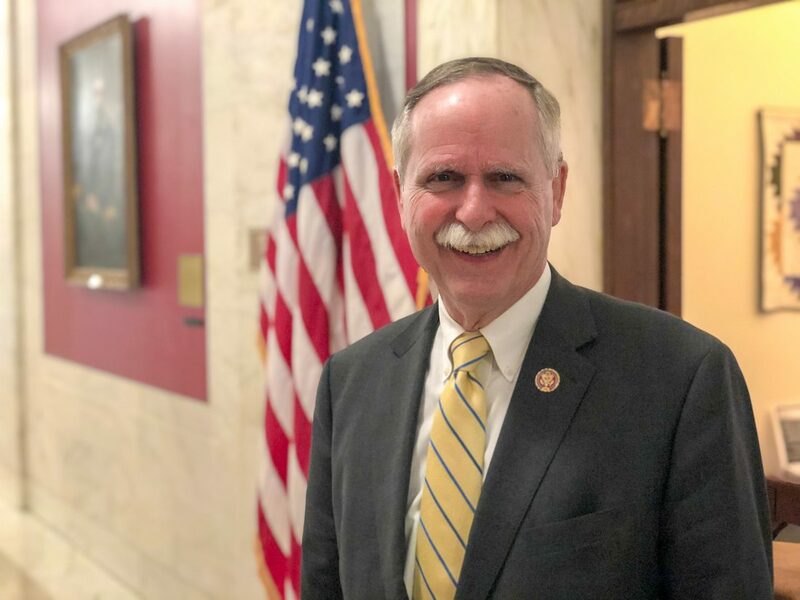 CHARLESTON — West Virginia’s 1st District congressman spent much of March traveling his district and the state, hearing about the issues that are important to residents and state leaders. U.S. Rep. David McKinley, R-W.Va., spent the beginning of March in Charleston meeting with Gov. Jim Justice and members of the state Senate and House of Delegates, where he once served representing the people of Ohio County. Last week, the four-term congressman was back in the district learning more about the opioid epidemic, issues facing correctional officers, and ways to help get food to those who need it most. McKinley said these are just some of the 300 meetings he has every year when he returns to the 1st Congressional District, which includes all of the Northern Panhandle and stretches from Wood County in the west to Mineral County in the east. “When we’re back in the district, we will hold meetings like we’ve been doing … because I think it’s important that we hear what is happening in the district to make sure they have a voice that we can share in Washington,” McKinley said. McKinley was able to secure a couple of wins for the district this month. President Donald Trump signed legislation sponsored by McKinley that increases the federal funding cap for Wheeling Heritage from $12 million to $15 million, allowing the economic development organization to secure more federal grants. It also created the new Appalachian Forest National Heritage Area that encompasses 16 West Virginia counties. “I think these entities and their mission of trying to protect our heritage is very important,” McKinley said. On March 18, McKinley met with the staff of the Mountaineer Food Bank in Braxton County. While not in his district, the food bank delivers all over the state. McKinley is looking to expand a pilot program he helped start in Ohio County when he was in the statehouse decades ago that took unused food from schools and prison and distributed the food to organizations with a need. McKinley would like to see a similar program at the federal level take unused food and distribute it to food banks and shelters. He wants to couple this with Good Samaritan legislation that would shield food banks from liability, and also provide grants for purchasing hot and cold delivery trucks. On Tuesday, McKinley visited the WVU Medicine Center for Hope and Healing, a substance abuse residential treatment center that opened in Morgantown in February. The facility provides 30 residential beds and 12 detox beds and is looking to hire as many as 40 full-time medical professionals. McKinley said one of the drawbacks in the fight against opioid abuse is the lack of in-state treatment facilities. He hopes that more facilities like the one in Morgantown can open to help keep victims of substance abuse closer to their families and provide a support system to stay clean. Another issue involving health care close to McKinley is the price of prescription drugs. A recent study by the Kaiser Family foundation found that 24 percent of adults and 23 percent of seniors say their prescription drugs are difficult to afford. The House Energy and Commerce Health Subcommittee hosted a hearing March 15 to discuss two bills McKinley is a co-sponsor of — the CREATES Act and the FAST Generics Act. Both bills are aimed at preventing pharmaceutical companies from using the legal system to withhold providing generic manufacturers with drug samples. McKinley is now in the minority after Democrats won most of the House seats in the 2018 general election. But being in the minority hasn’t prevented him from getting support for bills, such as the CREATES Act and the FAST Generics Act. McKinley also joined with a vast majority of the House to vote for a resolution asking for the report prepared by Special Counsel Robert Mueller regarding alleged collusion between President Donald Trump and Russia to be made available to the public. According to Politico, advisors to the president hinted that the White House might redact portions of the report citing executive privilege. It’s the level of bipartisanship McKinley has fostered that saw him rise in the Lugar Center and Georgetown University’s bipartisan Index. The report ranks members of Congress based on how often they work across party lines. McKinley ranks as the 11th most bipartisan House member.